May 10th, 2010, 10:00 a.m. — Tilden — Bottoms Up! Amoeba — and I was certainly feeling a bit …. oh, I can’t say that. It’s the answer to Punny Monday. Sorry everybody. I had the post set to auto-publish at 12:01 a.m., but apparently it had other ideas. In fact, it refused to publish this morning until I made it a brand new web page and deleted the first one. Some kind of glitch. Shoot (or shoe-t), that’s a hard one! Susan — don’t get too strung up about it. Well, well , well! it finally got published, now you have me thinking…sent you a (wrong) guess because: no guessing, no fun, right? Mar – -a wrong guess is better than no guess at all if you want to be sure you’re included in the game! This is a tough one…. I’ve sent a guess, though. Raven — it was tough. Thom — Totally Clueless is your common state, why should that make a difference to whether or not you make a wild & weird guess? Because nothing from that photo entered my brain. I was actually excited it wasn’t up this morning, thinking, Ah, now I have chance at it! I’ve been checking off and on all morning, then it comes up when I’m away from the computer for 45 minutes. Oh well — such is life. I’ve sent in one guess but I’m still pondering…. Barbara — WordPress was stringing everybody along today! I beg to differ with you. I had not one problem with WordPress yesterday and haven’t had for quite some time. Polona — plus the phrase I’m looking for is American slang, which leaves you far too many languages to sort through to get the right answer. Well, I still didn’t get here til an hour after you posted. Sigh. But my guess is in. Linda – -actually you sent several guesses in and becoming more and more frayed with each one! Alastair — well, thinking may have hurt, but content yourself with the knowledge you won. I sent a guess but I got an error. Maybe the computer knows I am wrong. Betty — I received your guess. It is indeed wrong, but not by much. I don’t know why the internet was being so critical. Congrats Alastair, just wondering if you had some Divine Help :}. I never would have got this. Bill — you think God playws favorites for Vicars? Congrats to Alastair. I never would have guessed that one, though I guessed all around it! There is a great variety of answers today! Barbara — there were a lot of guess today and most of them fit the photo like a shoe. I’m so behind I will never catch up, but it is always fun to see how everyone else did with Punny Monday! Ahhhh well… I missed it! I’m not sure if I would have gotten that one or not…. it wasn’t the FIRST thought I had, for sure! Melli — generally the first thing that comes to my mind when I see such things is, how much did their parents pay for those shoes? 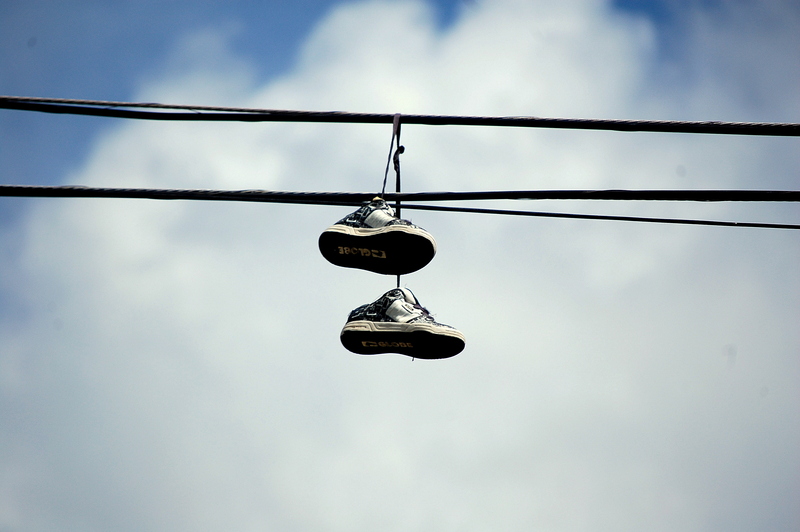 Caryl — I don’t know about “fancy” since I did see them, but one at least hopes the feet were loose and free when the shoes ended up on that wire! I was away most of the day, working on a devotion for Bible study tomorrow…so I missed it. I do wonder, when I see these things, what on earth was going on to get those shoes hung up there. Even worse is when it’s just one. You just wonder where you would donate the remainder? Kelley — I have never seen just one shoe. What provides the counterweight to make it stay up?